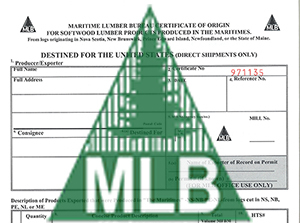 The MLB Certificate of Origin Program is the only log to lumber – lumber to destination program to exist in North America and has been in place at the MLB since 1996. The program has been enhanced on numerous occasions to provide information that expands well beyond the obligations in the previous SLA. For example, the Certificate of Origin was expanded to record the conditioning of scope products destined for the United States so that the degree of Phyto-Sanitary treatments being applied is known. The MLB Certificate of Origin program is considered a model import verification program by US Customs and Border Protection, that effectively prevents circumvention , whether through the Maritimes or otherwise. Verification of Certificate of Origin data is completed by conducting internal MLB weekly audits, quarterly reconciliation with mills and quarterly reconciliation with the Federal Department of Global Affairs. Over thepast several years, MLB audited reconciliation data has balanced to 99.99% with Global Affairs data. The MLB is also certified by the Canadian Food and Inspection Agency (CFIA) as a “service provider” for monitoring phytosanitary compliance of heat treated wood products. Another core function of the MLB is the Atlantic WoodWORKS! Program. Atlantic WoodWORKS! is a market diversification strategy to stimulate regional demand for wood building products and ensures the demand is serviced with regionally produced wood products. Atlantic WoodWORKS! educates decision makers (various levels of government), architects, engineers, code officials and developers on the environmental, economic and performance benefits of wood products. Quality is never an accident. Quality is always the result of high intentions, sincere efforts, and skillful execution. Quality represents the wise choice of many alternatives. The members of the Maritime Lumber Bureau have an abiding commitment to providing our valued customers, world wide, quality products and services.